Yuan Shu can use any tool card as any form of an attack with infinite reach. Yuan Shu cannot be the target of Raining Arrows or Chains. 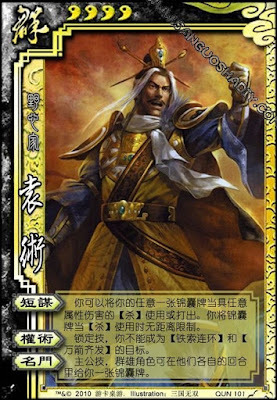 King Ability: Once during their turn, any hero can give Yuan Shu one tool card. Yuan Shu can use tool cards as Fire Attack, Lightning Attack, or Attack. This can happen during his turn or outside of his turn, for example during Duel. Yuan Shu can use tool cards as they are written or as a form of attack it is an option. When a hero passes Yuan Shu a tool card, it is done face up.